The Mason St. Bakehouse® difference: making real ingredients taste really good. Fresh-baked in small batches with thoughtful, wholesome ingredients. It’s truly snacking you can feel good about! 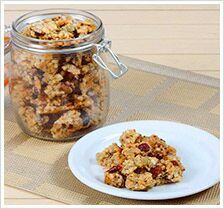 Our granola is a deliciously crunchy blend made with whole grain rolled oats, seeds & fruits. Made simple, with no artificial flavors, colors or preservatives. This granola is great for breakfast or snacking!